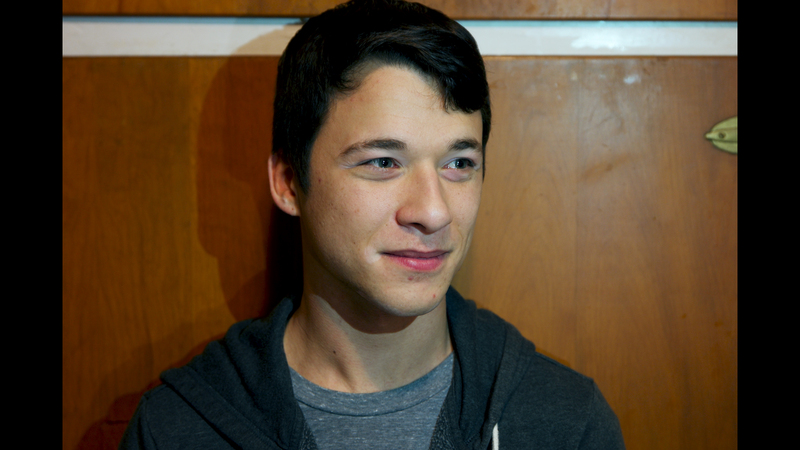 We’ve made it to the last week of previews for this cycle! Today we will wrap up the cards from Fiona’s base deck, followed by James’ deck later this week. Today’s cards tie together some loose ends in the deck, giving us a cohesive understanding of how Fiona operates in battle. Let’s get right to it! 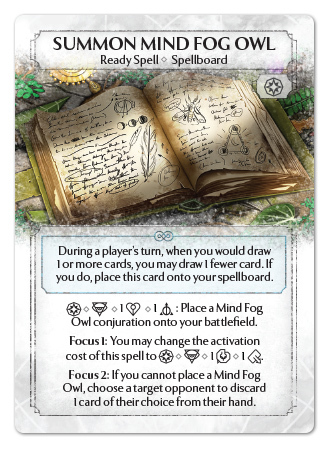 The last of Fiona’s conjurations, the Mind Fog Owl is a new charm summon with a lot to unpack. 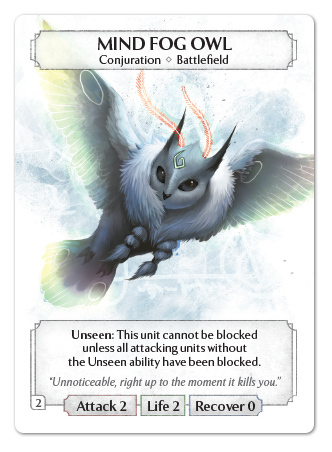 On its surface, this new owl can be summoned for 2 dice, giving us a 2/2/0 unit with the Unseen ability. When attacking with a Mind Fog Owl, this ability will prevent units from blocking it if you have other units that cannot be blocked. Charm magic is already home to Hypnotize which can activate the Unseen ability, as well as the recently introduced Majestic Titan with the Gigantic 2 ability! Being able to plan reliable ways to get the Mind Fog Owl past enemy defenses can be a key way for charm players to get in the extra damage they need to close out games when other means can’t quite do it. The Focus 1 effect on the Owl book changes the activation cost to only 1 die, as well as a discard. This cheaper die cost, as well as the possibility to get advantage out of discarding cards like New Ideas, makes focusing this spell an enticing prospect. If that wasn’t enough, the Focus 2 effect rewards paying to summon more Owls than you can place on your battlefield by forcing your opponent to discard a card from their hand! Lastly, when this spell is in your discard pile, you can use the Between Realms effect to opt out of drawing a card. and return this spell to to your hand! 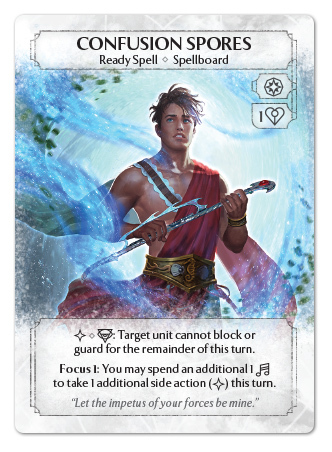 Now that’s a whole lot of utility for one spell, but let’s take a look at two more support cards for this new conjuration! Exhortation is a charm and sympathy action spell that is played as a side action. This spell allow you to choose two units you control and have them gain an attack boost equal to each other’s attack value! This spell forms a perfect union between the Mind Fog Owl and the Majestic Titan. When using Exhortation, each of these conjurations will give the other +2 attack! This is most valuable to use when there isn’t an enemy unit that can block from the Titan’s Gigantic 2 ability, giving the Owl a chance to use Unseen and hit the enemy Phoenixborn with a boosted attack! This 8 damage combo can pose a significant threat to any partially damaged Phoenixborn, and even more so if either the Owl or Titan has a Massive Growth attached! This last ready spell is one more trick Fiona has to help her Mind Fog Owls get the final blow on enemy Phoenixborn. 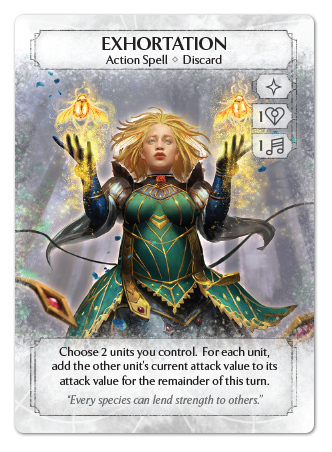 Confusion Spores only costs a charm class die to put into play, and grants a free to use side action ability that disables a unit’s ability to block or guard for the turn! It may not be as catch-all as Hypnotize, but with the right support, Confusion Spores is an enticingly cheap way to sneak some extra damage in. Even more, you can imbue this ready spell with sympathy magic to regain the side action you’ve spent to activate Confusion Spores in the first place! With enough sympathy magic, you could use 3 Confusion Spores in a turn, followed by an Exhortation to set up a massive lethal attack! That’s all for the Protector of Argaia Expansion Deck! There is plenty of experimentation do do with these new cards and I hope you are eager to try them out. Stay tuned for the conclusion of the Grave King’s deck later this week!